RPG LAND :: View topic - RPG Maker Game Projects? Posted: Thu Oct 12, 2006 7:14 am Post subject: RPG Maker Game Projects? Is it okay to post about that here? My friends and I already started on a bunch before, but they'll be released..
Posted: Thu Oct 12, 2006 12:03 pm Post subject: Re: RPG Maker Game Projects? We've been tossing around the idea of brining back these types of games/projects onto the actual site. I'd be interested in hearing about your project. I hope it's an original RPG Maker project, not like a lot of this fan crap you see these days. I should get my hands on RPG Maker, get some friends to help out, see what can't come up. still working on with my friends. Oh yeah, that RPG Maker XP came out a long while ago, didn't it? Heh. I was going to download the 30 day trial and then said "Wait a minute! I'd never get anything done in that time, and I'm busy with school anyways!" so I decided against it. The RPG Maker programs themselves are pretty interesting engines for creating the games, but since you get a lot of lazy games (or clones of other games) being made and published on the internet using prepackaged sprites, music etc., it's gotten a pretty bad rap. ^^; Also the reason that that engine from Hamster Republic, which came with nothing except some general .BAM music files and a few test images, winds up with very, very few games at all. Talking of making games, I was doing my C++ homework yesterday, and then browsing around looking at Cave Story stuff (<5MB for one of the best games in the past few years, totally fits on my new flash drive), and there was mention of someone making a GBA port of that game vs. a DS port. In passing, the person creating the port mentioned that C is the language used for GBA games. Whoa. Imagine that. It would require an emulator and some starting research on the subject (binary codes for the screen modes, addresses of sound and video triggers, conversion tools, etc. ), but that'd be pretty cool to try out sometime. ^^ Maybe this summer. Also the reason that that engine from Hamster Republic, which came with nothing except some general .BAM music files and a few test images, winds up with very, very few games at all. props for even mentioning it. I loved ohrrpgce (might be off). Did I do something against the site rules? 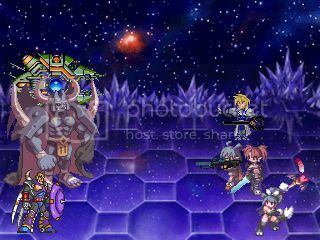 Sigma has a shield as in MMX3 (Megaman X3), and Baal has no weapons. original sprites totally pwn. Good job completely avoiding them; it's hard these days! H-E-S-T-E-R is a long, convoluted joke. Yeah that's a big problem with most of these projects. It's all ripped stuff. It's hard to find original RPG Maker games. Still some effort is there and to each their own. Wow... when i saw this topic i had to reply. i worked on my own rm2k project for almost 2 yrs and its done. i have run it through so many test runs but i still need more testers. There are some screenshots on my website. i read 30 day trial? how much is it to have full version? I downloaded a rather illegal version called RPG Maker XP: Postality Knight's Edition. Honestly, though, most of the projects I see are so unoriginal (see OP) and working with what is given is, well, kind of tedious.